Aluminum picnic tables are extremely versatile, making them the best option for those looking for a maintenance-free table. These tables offer the user more choices for placement without having to worry about weather conditions. 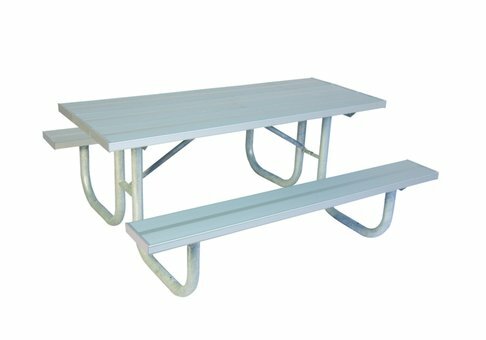 Aluminum picnic tables are heavy duty, yet lightweight alternative to thermoplastic steel and wood picnic tables. The aluminum picnic table allows for the greatest mobility of any picnic table. These tables are perfect for facilities with groundskeeping or landscaping crews as they are easily picked up and moved for better access to pesky weeds and overgrown grass. Not only will it make the workload easy for landscaping crews, but these tables allow more opportunity to be placed in different locations for greater usage. By having a table that can be easily moved, you are able to increase the use of your investment. While aluminum picnic tables are lightweight, they are also a durable option, as well. These tables are able to endure all weather conditions without rusting. They also stand strong against denting and warping. Aluminum picnic tables are by far the best choice for versatility. They provide a mobile alternative to heavy steel and wood picnic tables, giving these tables better utility and function. These tables are also able to withstand the test of time, regardless of the elements they are placed under.